Mark Streiff, a 56-year-old financial consultant from Mission Viejo, Calif., has carried the momentum from his 2012 NHC Tour victory into 2013, earning $10,000 for topping the first-half leader board of this year’s Daily Racing Form National Handicapping Championship Tour. The Tour’s first half concluded on July 31. Streiff also won $7,000 in bonus money for three first-place finishes over the six-month span. A total of $25,000 was paid to the top eight first-half finishers, ranging from Streiff’s top prize of $10,000 to $1,000 to the eighth-place finisher. An additional $150,000 will be paid on a graduated scale to the cumulative top 20 finishers throughout the entire contest year. The full-year 2013 NHC Tour leader will receive $75,000. By virtue of his first-half success, Streiff is one of 175 competitors who have already qualified for the January 24-26, 2014, Daily Racing Form/NTRA National Handicapping Championship presented by Racetrack Television Network, Sovereign Stable and Treasure Island. To be held for the third consecutive year at Treasure Island Las Vegas, next January’s NHC Finals will offer a total purse of at least $1.5 million, with first-place worth a guaranteed minimum of $750,000. Streiff, who counts attentive viewing of replays and post parades among his most effective handicapping tools, will now turn his attention to becoming the overall Tour’s first repeat winner. Brent Sumja of San Anselmo, Calif., finished second during the first half and received bonus money of $5,000. Paul Hoffman ($2,500), Kevin Cox ($2,000) and Charles Browning ($1,700) rounded out the first-half top five. Seven of the top 20 First-Half Tour finishers, including Streiff, received additional checks totaling $29,000 thanks to the NHC Tour bonus provision that rewards anyone who finishes first in more than one qualifying tournament. A player may earn up to four bonuses during the Tour year. The full list of first-half standings can be found online at http://ntra.kinsta.com/en/nhc/nhc-tour-leader-board. The overall 2013 NHC Tour Leader Board standings can be found online at /en/nhc/nhc-tour-leader-board. The NHC Tour is a yearlong bonus series offering additional prize money and qualifying berths to the DRF/NTRA National Handicapping Championship. Tour members receive NHC Tour points for top finishes in NHC qualifying events held during the year. Membership in the 2012 Daily Racing Form NHC Tour is open to adults 21 years of age or older and requires a one-time membership fee of $50. Membership in the 2012 Daily Racing Form NHC Tour is mandatory in order for top finishers of sanctioned NHC qualifying events to be eligible to compete in the January 2013 NHC Finals in Las Vegas. The NHC Tour membership must be in place prior to the start of any given qualifying tournament in order for one to qualify for the NHC Finals at that qualifying tournament. In addition to potential prize money and berths in the NHC, benefits for NHC Tour members include automatic enrollment in the Horseplayers’ Coalition. The Coalition seeks legislative and regulatory solutions to tax and business issues that impact pari-mutuel racetracks and their customers and provides grass roots support for the NTRA’s lobbying efforts on Capitol Hill. Tour members also are automatically eligible to participate in NTRA Advantage, offering preferred pricing on products and services from leading suppliers, including John Deere, Sherwin-Williams, UPS and OfficeMax. In just its 14th year, the Daily Racing Form/NTRA National Handicapping Championship presented by Sovereign Stable and Treasure Island is the most important tournament of the year for horseplayers and is the culmination of a year-long series of NTRA-sanctioned local tournaments conducted by racetracks, casino race books, off-track betting facilities and horse racing and handicapping websites, each of which sends its top qualifiers to the national finals. There is no option to “buy in” to the NHC Finals—all competitors must have earned the right to compete. Each year, the NHC winner joins other human and equine champions as an honoree at the Eclipse Awards. 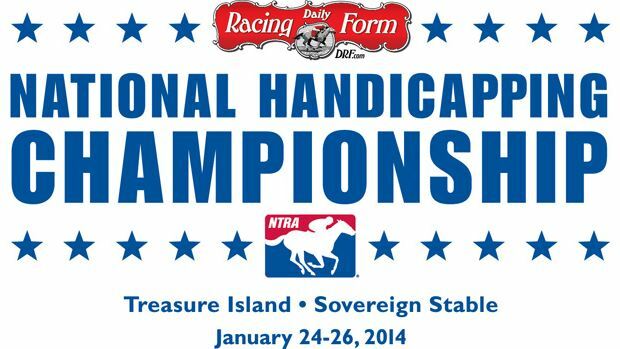 In addition to the founding title sponsor, the NHC is presented by Treasure Island Las Vegas and Sovereign Stable. The 13 NHC Champions since the event’s inception, in chronological order, are Steven Walker, Judy Wagner, Herman Miller, Steve Wolfson Jr., Kent Meyer, Jamie Michelson, Ron Rippey, Stanley Bavlish, Richard Goodall, John Conte, Brian Troop, John Doyle and Michael Beychok. The NTRA is a broad-based coalition of more than 80 horse racing interests consisting of leading Thoroughbred racetracks, owners, breeders, trainers, horseplayers and affiliated horse racing associations, charged with increasing the popularity of horse racing and improving economic conditions for industry participants. The NTRA has offices in Lexington, Ky., and New York City. NTRA press releases appear on the NTRA website, NTRA.com.